Attending the presentation of the City of Washington Court House Police Department Scholarship are (l-r) Detective Colt Sever, Patrolman Mike Warnecke, scholarship recipient Ethan Conn, and SSCC Dean of Technical Studies Jeff Montgomery. The Washington C.H. 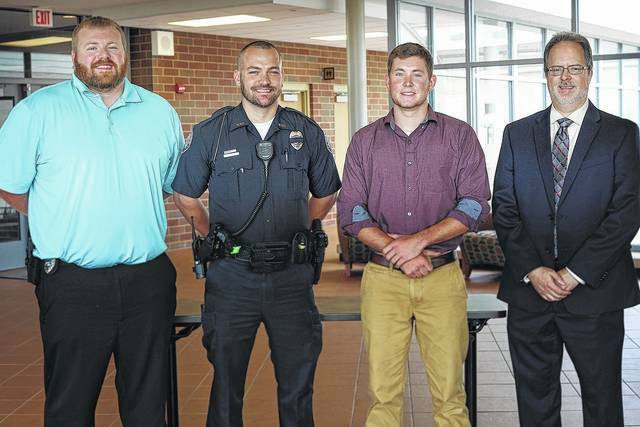 Police Department presented its annual scholarship to Ethan Conn, a 2017 graduate of Miami Trace High School and the son of Glenn and Kristen Conn.
Conn will begin classes at Southern State Community College when fall semester begins Aug. 21. He plans to major in agriculture production. The Washington Court House City Police Department Scholarship, through the Southern State Community College Foundation, is earmarked for Fayette County residents who are recent graduates of Washington Senior High School or Miami Trace High School. Scholarship recipient selections are based on a cumulative GPA of 2.6 as well as a demonstration of good leadership qualities, community involvement, and academic excellence. To learn more about scholarship opportunities at Southern State, please visit www.sscc.edu/financialaid/scholarships.shtml. https://www.recordherald.com/wp-content/uploads/sites/27/2017/07/web1_WCH-PD-presents-SSCC-scholarship-PIC.jpgAttending the presentation of the City of Washington Court House Police Department Scholarship are (l-r) Detective Colt Sever, Patrolman Mike Warnecke, scholarship recipient Ethan Conn, and SSCC Dean of Technical Studies Jeff Montgomery.